© Notacornfield. Courtesy the Annenberg Foundation. An urban agriculture project that sought to reconnect residents of Los Angeles with their natural environment. 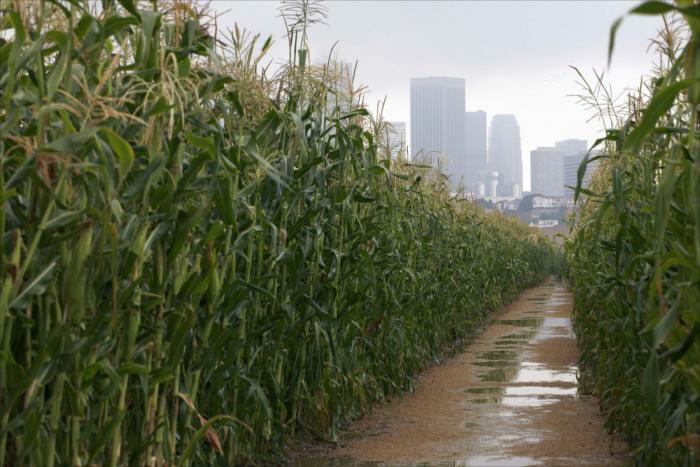 Not a Cornfield was a 13-hectare cornfield planted to remediate an industrial brownfield. Seeding, maintenance, and harvesting were organized to involve locals from all over the city, establishing links to water and seasonal cycles that are otherwise obscured by the city’s concrete infrastructure. The site is gradually becoming a state park, and the project led to the creation of Farmlab, an interdisciplinary studio in Los Angeles. The South Central Farm was bulldozed at almost the same time as Not a Cornfield was created. This event created a surplus of fertile land and established fruit trees that had to be moved to be saved – several Farmlab projects thus emerged including: Agbins, recycled boxes containing rich soil from the South Central Farm, and Junker Gardens, a proposal for using car wrecks as gardening containers.